Ellen Browne was born in 1824 to and according to her testimony her mother was called Catherine. She had two brothers, John and Thomas, and two sisters, Mary Ann and Esther. We know from her prison records that she was able to read but not write and was a Roman Catholic. There is a possibility that she was born in Birr, County Offaly, but this has not been confirmed. Ellen Browne was known in the Limerick courts of 1845. 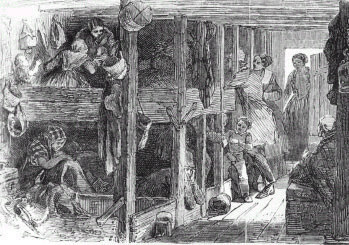 She was imprisoned first on 2 September 1844 for six months at hard labour for larceny and 14 days for assault. She was released in March 1845, but her freedom did not last long. She was soon back in prison, 18 August, for stealing clothes of Mr O’Neill. This was the beginning of the Great Famine and Transportation for petty crimes was common practice to alleviate the build up of prisoners in the gaol. As a result on 1 November 1845, twenty-one year old Ellen Browne was re-sentenced to 7 years transportation. She did not take the sentence well and on Sunday 16 November 1845 the five foot one inch woman escaped from Limerick Gaol. The news spread quickly of her escape and a reward of £3 was issued for her discovery. The report in the Limerick Chronicle described her as brown/black hair, dark eyes, fair completion, with a large freckle on her forehead. She was wearing a brown dress, whitish handkerchief, brown apron, blue stockings and shoes at the time of her escape. She was finally apprehended and taken to Ennis Gaol on the 21 November 1845. From there she was moved to Dublin on the 15th of June 1846. She was then transported to Van Diemen’s Land (Tasmania), Australia by the ship “Arabian” on the 22 November 1846. It would take three months for the ship to reach Australia and she arrived on 25 Feb 1847 where she received the prisoner number 823. While in prisoned she carried out a number of misdemeanours which elongated her sentence, including in 1849 when she “disappropriated bread intrusted to her” which added a further 14 days to her sentence. She received her “Free Cert” and was released from the prison on the 29 October 1852. In November 1850 she was given permission to marry fellow convict John McCann, though it is uncertain if this marriage actually took place. This was not the first or last time that women escaped from Limerick gaol, in 1830 nine women and a baby made their escape under the cover of night. Sources: Limerick and Dublin Prison Records, Limerick Chronicle, Freeman’s Journal, National Archives of Ireland – Transportation Records, Archives Office of Tasmania.